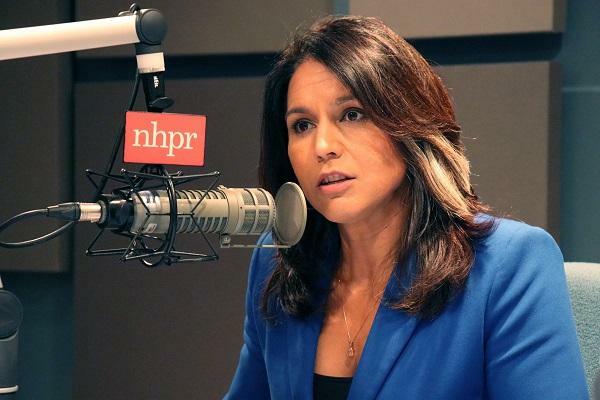 Gabbard has made foreign policy among her top issues. And, speaking on The Exchange, she defended a controversial 2017 meeting she held with Bashar Al-Assad of Syria – a trip criticized by many at the time. Gabbard called it “a mission of peace.” She says she met with both Syrians concerned that toppling Assad would leave a vacuum for such groups as ISIS and Al Qaeda and opponents of Assad, who objected to U.S. intervention, preferring to bring about change on their own. Gabbard also addressed the opioid crisis, gun control, and immigration, among other topics. You were a supporter of Bernie Sanders. Now, you're running against him. How do you see yourself differing from him politically? I'm a soldier currently serving the Army National Guard now for almost 15 years, deployed twice to the Middle East, and in Congress for over six years I have served on both the Armed Services and Foreign Affairs Committees. These experiences are unique in this field of candidates who are running for president. The most important responsibility the President has is to serve as Commander In Chief. And so the experience, the qualifications, and the credibility that I bring to this job come from those experiences, and it's why I'm running for president. You’re calling for a sea change in foreign policy; what do you mean by that and why are you the best person to carry this out? For too long -- I think across both administrations -- we have seen this this fossilized mentality of a zero sum game, that you're either with us or against us, that in order for the United States and for the American people to win, other people in other countries must lose. As a result of this, we're seeing for example how we're in a position today where we're at a greater risk of nuclear catastrophe than ever before, given the increasing tensions between the United States and other nuclear-armed countries like Russia and China. There are always going to be disagreements or issues that we need to resolve with other countries. But we have to be willing to have those open lines of communication and be willing to cooperate on areas of common interest and shared interests. That makes our country stronger and that makes, frankly, the world better and gives us a greater opportunity for peace. What do you think needs to happen when it comes to protecting the integrity of the U.S. elections against foreign interference – as we saw in 2016. There are important issues that we've got to look at as far as influence and what foreign actors or agents are trying to influence our elections. But I think there's an underlying issue that is extremely urgent that Congress still has failed to address, which is the integrity of our election systems themselves. I introduced legislation called the Securing America's Elections Act to address this because still we see far too many states who use electronic voting systems that have no paper backups. So my bill would protect us from any kind of foreign state or rogue actor from hacking into our system and changing our votes by making it mandatory that you either have paper ballots, or, if you're using an electronic system, you have a voter-verified paper backup. This is something that is essential that we implement immediately to make sure that our 2020 elections can be carried out without voters questioning who may be manipulating the outcome. Do you support or oppose sanctions on Russia for interfering with American elections? The sanctions have to have a clear objective. And we also have to be honest about what we are doing, so that we can be a fair negotiator in fixing the problems that exist. What do you think of a guaranteed basic income as at least one other presidential candidate is pushing for? It's something I'm actually taking a serious look at. I think there's opportunity there to look at many of the different programs that we have in place to provide assistance to people and seeing how we can perhaps bring down the overhead cost of that bureaucracy and provide a basic income for folks – and looking at how we can help lift people out of poverty and provide some level of certainty. It wouldn't be enough to completely replace someone's income by any means but to be able to have that basic level of economic security I think is something that we should work towards. When it comes to the issue of immigration, some Democrats have called for abolishing ICE. Do you agree? I don’t. I think abolishing the agency itself doesn't actually deal with the problem that we are seeking to solve. It's heartbreaking to hear the stories of people who are being impacted essentially by an agency that acts without any real oversight or accountability. This speaks to a problem with leadership more than it does the agency itself. If you just get rid of the agency, if you just abolish ICE, there will be some other entity, whether it be federal or state, that steps in to fill that void of enforcing our immigration laws. We've got to get to the heart of the problem and address that. Are you concerned about this country’s level of debt? I bring up the cost of war because the trillions of dollars that we're spending on these wasteful wars and nuclear arms race -- those are trillions of dollars that we need that we need to either put back in our pockets and to invest in the needs of our people to invest in things like infrastructure, to invest in education, to invest in health care. After New Zealand attacks on two mosques, what can you say to American Muslims who are on edge? We have to stand united in this country against religious bigotry racism and the kind of hatred and vitriol that leads to tragedies and atrocities like we saw in the massacre in Christchurch in New Zealand, like the massacre that we saw happened not too long ago here at the synagogue in Pittsburgh. Whether it is Muslims or Jews or Hindus or others who are the targets of this violence based in this religious bigotry and hatred, we have to stand united in condemning not only these actions but the hateful rhetoric and bigotry and discrimination that ends up leading to these actions. Would you support any changes in federal gun legislation? We have to uphold the Second Amendment of our Constitution and people's right to bear arms, but we also must make sure that we have sensible safety regulations in place to try to prevent those who have no business owning a gun because they may use it to seek to do harm to others from doing so. The House of Representatives recently passed legislation making universal background checks mandatory. This is a bill that we hope gets through the Senate. And would you support banning AR 15 guns? What would you do as President to stem the opioid crisis? I've introduced the Opioid Accountability Act in Congress that would provide an avenue to hold these prescription drug companies like Purdue Pharma accountable for their lies and deception and their practices -- basically to get as many of these opioids into our communities and onto our streets as possible. The penalties could be financial or criminal. Look at look at how many peoples’ lives have been ruined -- and who have lost their lives -- because of this opioid epidemic. And yet that kind of accountability, that kind of criminal prosecution for that, hasn't taken place.